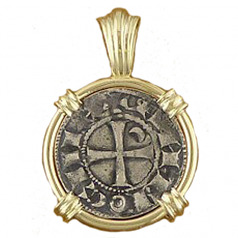 Silver Crusader Denier Coin Pendant Circa 1163 - 1188. 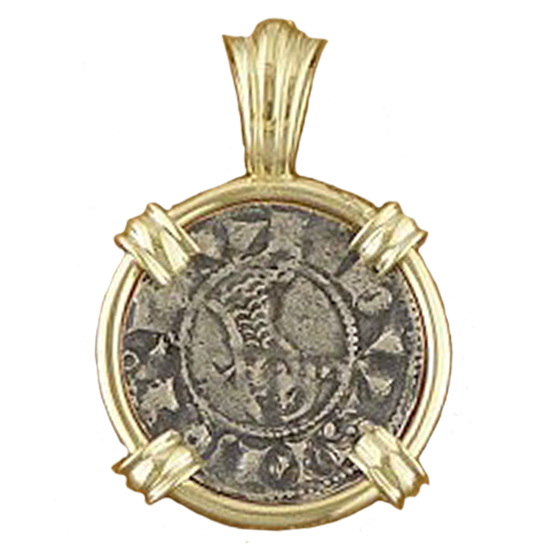 Obverse: +BOAHVHDVS, (Bohemond III, Prince of Antioch) helmeted and chain-mailed bust; crescent and star flanking. Reverse: +ANTIOCHIA, central Jerusalem cross with crescent in quadrant. Ruler: BOHEMOND III; Mint: Antioch (present day Antakya); Country: Syria (present day Turkey). Framed in 14Kt Yellow Gold. Dimensions; 3/4" wide, 1-1/8" drop, including bail.